We wait all year for Spring to come along, and with it comes Bissinger's famous Milk Chocolate Easter Eggs to delight any child or worthy recipient this Easter. Made by hand using only the finest ingredients, each egg is carefully wrapped in Easter-themed foil for a delightful gift they won't soon forget. 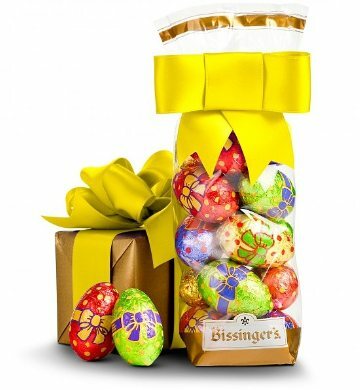 This gift includes the following: Bissinger's Chocolate Easter Eggs (7 oz). Bissinger's Handcrafted Chocolatier: With roots tracing back to 17th century France, the Bissinger family produces premium handcrafted chocolates in the traditional European style. Small batch recipes passed down the generations have survived to bring chocolate lovers the finest in artisan craftmanship. Gift arrives in a stunning golden gift bag with a hand-tied yellow bow. Gift measures 10" x 4" x 3".